The video begins with why Options trading is a lucrative and a different aspect of the stock market compared to others. Most of the people who trade or invest in the financial markets use fundamental or technical analysis to analyse the markets. But when it comes to the execution of the trades, options become a very good support tool for the trader for speculation as well as hedging. A very good internet connection: Trading in the financial markets, especially in options is a very risky endeavour and having a good and fast internet connection is essential for the proper execution of trades. Charts: Charts are the backbone of trading. Charts show us the historical data of the markets and all the price actions associated with it. We can understand the direction of the markets and identify the uptrends and downtrends and take directional trades accordingly involving call option or put option. Excel: Excel sheets are really an important part of options trading because, for example, when a trader looks at the option chain of Nifty, he may get confused why the 8500 call option is priced at a certain level or the 8000 put is priced at certain level because since the last few months nifty has been trading in a range and excel can be used to monitor the open interests and the straddle, strangle, or butterfly strategy prices in real time using web query. Online/offline trading account: The trader should have an online or offline trading account to place his trades. A discount broker is more preferable as high commissions from brokers can limit your trading opportunities in options. Twitter for news and updates: Twitter provides a faster and easier mode of delivery of important market news to the traders in time. The timely information helps the traders to place trades at the proper execution time and take maximum profits from the trades. Strategy Know-how: To trade in options, the knowledge of option strategies are a necessity for the traders. Strategies like Straddle, Strangle, Bull spread, Bear Spread and how the decide the time and price when the strategy is to be traded are decisions which require proficient understanding of option strategies. Lots of Capital: Compared to equity markets, Trading profitably in the derivatives market requires lots of capital for the margin requirements. In case of buying or selling Future contracts such as Nifty Future and shorting option contracts which is a widely and profitably used trading method of institutional traders as well as retail, there are margin requirements by the stock exchange which have to be met. For example, if the trader wants to short Nifty call option or put option, he has to provide a margin of about Rs.15000 per lot of Nifty to the National Stock Exchange (NSE). All these provide an important and efficient setup for profitable trading in the options markets. The trading setup can be a 2 screen setup or a 4 screen setup. A person has to be very focused while he is trading. The setup should be in such a way that the trader can see all the prices that he wants in real time and live. 4 screen setups are for advanced traders who required more information for trading. They see their charts, their excel sheets, their trading account and all other information together at the same time. Futures BUY/SELL position and Options Sell Positions. Margin shall be debited from the linked bank account after adjusting shares margin. Withdrawal of margin can be done till 7 PM Mon-Fri. Margin will be different for different securities. It calculates the Option price, Volatility, the Option Greeks such as Delta, Gamma, Theta, Vega and Rho. It takes the futures value as the input value. Option prices are made of time value and intrinsic value. The calculator helps the trader to determine the time value and prices the options accordingly. Hence understanding about time value and volatility etc comes only through it. The third video comprises the impact and criteria of how the Security Transaction Tax (STT) is calculated and charged by the brokers has also been discussed in the video. Security Transaction Tax is charged by the exchange if the option contracts held by the trader expires In the Money (ITM Option). Hence, by the end of the videos, it can be concluded that Options are a wonderful tool for traders to place their bets for all types of markets - trending/sideways. 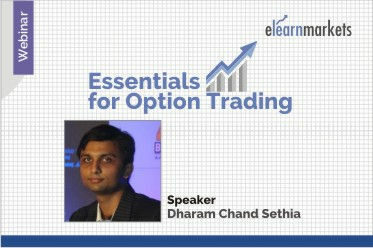 How traders can take advantage of liquidity in the options, how to trade USDINR options, whether trading in options near expiry are too risky, all of these and much more can be concluded from the course of How to Trade Options.